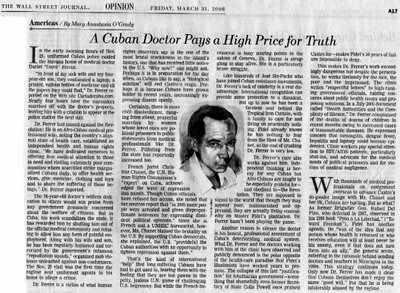 A Cuban Doctor Pays A High Price for Truth. 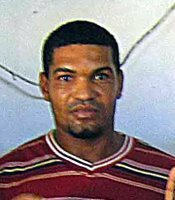 In the early morning hours of Nov. 29, uniformed Cuban police raided the Havana home of medical doctor Dariel "Darsi" Ferrer. "In front of my sick wife and my four-year-old son, they confiscated a laptop, a printer, various bottles of medicine and all the papers they could find," Dr. Ferrer reported on the Web site Cartadecuba.com. Nearly four hours later the marauders marched off with the doctor's property, leaving him with a citation to appear at the police station the next day. 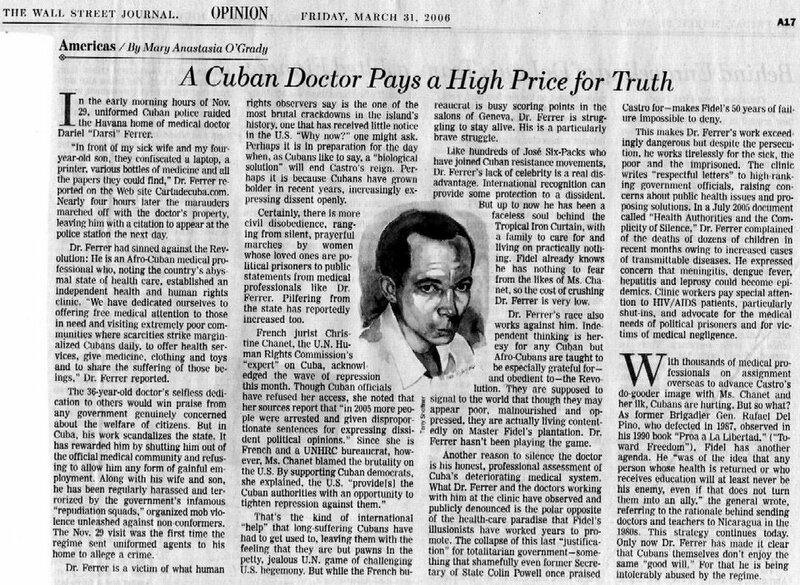 Dr. Ferrer had sinned against the Revolution: He is an Afro-Cuban medical professional who, noting the country's abysmal state of health care, established an independent health and human rights clinic. 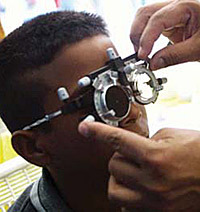 "We have dedicated ourselves to offering free medical attention to those in need and visiting extremely poor communities where scarcities strike marginalized Cubans daily, to offer health services, give medicine, clothing and toys and to share the suffering of those beings," Dr. Ferrer reported. The 36-year-old doctor's selfless dedication to others would win praise from any government genuinely concerned about the welfare of citizens. However, in Cuba, his work scandalizes the state. It has rewarded him by shutting him out of the official medical community and refusing to allow him any form of gainful employment. Along with his wife and son, he has been regularly harassed and terrorized by the government's infamous "repudiation squads," organized mob violence unleashed against non-conformers. The Nov. 29 visit was the first time the regime sent uniformed agents to his home to allege a crime. Dr. Ferrer is a victim of what human rights observers say is the one of the most brutal crackdowns in the island's history, one that has received little notice in the U.S. "Why now?" one might ask. Perhaps it is in preparation for the day when, as Cubans like to say, a "biological solution" will end Castro's reign. Perhaps it is because Cubans have grown bolder in recent years, increasingly expressing dissent openly. Certainly, there is more civil disobedience, ranging from silent, prayerful marches by women whose loved ones are political prisoners to public statements from medical professionals like Dr. Ferrer. Pilfering from the state has reportedly increased too. French jurist Christine Chanet, the U.N. Human Rights Commission's "expert" on Cuba, acknowledged the wave of repression this month. Though Cuban officials have refused her access, she noted that her sources report, "in 2005 more people were arrested and given disproportionate sentences for expressing dissident political opinions." Since she is French and a UNHRC bureaucrat, however, Ms. Chanet blamed the brutality on the U.S. By supporting Cuban democrats, she explained, the U.S. "provide[s] the Cuban authorities with an opportunity to tighten repression against them." That is the kind of international "help" that long-suffering Cubans have had to get used to, leaving them with the feeling that they are but pawns in the petty, jealous U.N. game of challenging U.S. hegemony. However, while the French bureaucrat is busy scoring points in the salons of Geneva, Dr. Ferrer is struggling to stay alive. His is a particularly brave struggle. Like hundreds of José Six-Packs who have joined Cuban resistance movements, Dr. Ferrer's lack of celebrity is a real disadvantage. International recognition can provide some protection to a dissident. But up to now, he has been a faceless soul behind the Tropical Iron Curtain, with a family to care for and living on practically nothing. Fidel already knows he has nothing to fear from the likes of Ms. Chanet, so the cost of crushing Dr. Ferrer is very low. Dr. Ferrer's race also works against him. Independent thinking is heresy for any Cuban but Afro-Cubans are taught to be especially grateful for -- and obedient to -- the Revolution. They are supposed to signal to the world that though they may appear poor, malnourished and oppressed, they are actually living contentedly on Master Fidel's plantation. Dr. Ferrer has not been playing the game. Another reason to silence the doctor is his honest, professional assessment of Cuba's deteriorating medical system. What Dr. Ferrer and the doctors working with him at the clinic have observed and publicly denounced is the polar opposite of the health-care paradise that Fidel's illusionists have worked years to promote. The collapse of this last "justification" for totalitarian government -- something that shamefully even former Secretary of State Colin Powell once praised Castro for -- makes Fidel's 50 years of failure impossible to deny. This makes Dr. Ferrer's work exceedingly dangerous but despite the persecution, he works tirelessly for the sick, the poor and the imprisoned. The clinic writes "respectful letters" to high-ranking government officials, raising concerns about public health issues and proposing solutions. In a July 2005 document called "Health Authorities and the Complicity of Silence," Dr. Ferrer complained of the deaths of dozens of children in recent months owing to increased cases of transmittable diseases. He expressed concern that meningitis, dengue fever, hepatitis and leprosy could become epidemics. Clinic workers pay special attention to HIV/AIDS patients, particularly shut-ins, and advocate for the medical needs of political prisoners and for victims of medical negligence. With thousands of medical professionals on assignment overseas to advance Castro's do-gooder image with Ms. Chanet and her ilk, Cubans are hurting. But so what? As former Brigadier Gen. Rafael Del Pino, who defected in 1987, observed in his 1990 book "Proa a La Libertad," ("Toward Freedom"), Fidel has another agenda. He "was of the idea that any person whose health is returned or who receives education will at least never be his enemy, even if that does not turn them into an ally," the general wrote, referring to the rationale behind sending doctors and teachers to Nicaragua in the 1980s. This strategy continues today. Only now, Dr. Ferrer has made it clear that Cubans themselves do not enjoy the same "good will." For that, he is being intolerably abused by the regime. 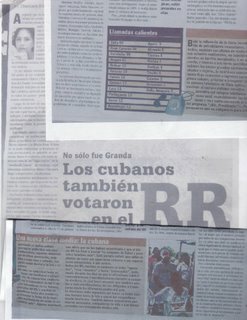 Dr. Ferrer is the Director of Center for Health and Human Rights “Juan Bruno Zayaz” in Havana, Cuba. Address: Calle San Bernardino 265 entre Serrano y Durege, Reparto Santo Suárez, Municipio Díez de Octubre, Ciudad de la Habana. Cuba. Código Postal -10500. Ciego de Ávila, Cuba – marzo 2003 - Desde que los gobiernos de Cuba y Venezuela inventaron la Operación Milagro, a muchos cubanos los espacios se les comprimieron, pues se sabe que hasta los hoteles serán transformados en clínicas. Sin embargo, las cosas no se quedan ahí. El hospital general de Morón, famoso por lo deteriorado de sus servicios, tampoco escapa a la aventura del trueque salud por petróleo, que incrementa más aún la crisis de los cubanos. En el hospital existe un oasis en medio de tantas cosas negativas que tiene el servicio de salud en la isla. En el tercer piso se encuentra la Sala de Gastroenterología, donde profesionales como la doctora Gladys Guirola Montejo se esfuerzan por brindar lo mejor a sus pacientes. La sala dista mucho de las otras. Allí se respira confort y todo se mantiene exactamente igual al día de su inauguración, en 1990. Como era de esperar, los malos ojos de quienes ponen y mandan en Cuba se presentaron en la las oficinas de la dirección del Hospital y eligieron la sala de Gastroenterología para instalar allí el programa de la Operación Milagro. La reacción de los galenos y especialistas no se hizo esperar; pero sus protestas se estrellaron contra la infranqueable administración del centro que, en pocos días, desalojó la sala de Gastroenterología, que brindaba desde hace años un esmerado servicio especializado a los cubanos. Los pacientes que fueron mudos testigos de las fricciones entre los médicos y los administrativos se preguntan: "¿Donde seremos atendidos?" Hasta el momento no existe una respuesta de parte de las autoridades competentes. Después de consumados los hechos algunos médicos se muestran apáticos, como reflejo de tanta impotencia acumulada. Otro callejón sin salida por donde camina a oscuras la vida de los cubanos. Jamás podré olvidar aquellos días que pasé junto a mi familia materna. Lo primero que me impresionó fue sentir de una manera tan intensa el sabor del azúcar. Todo era dulce allí: las personas, los muebles de las casas, las paredes de madera, los caminos, los trillos. Hasta el agua de beber y la lluvia eran dulces. Bien las recuerdo. El pueblo apenas se extendía a lo largo de cien metros. La calle en el centro y a cada lado las casas, todas pertenecientes a los trabajadores del central. No había manera de perderse por recovecos o bocacalles. El central, sobre todo de noche, parecía un fantasma sobre el lomerío, y en época de molienda, cuando se trituraba la caña para convertirla en azúcar, era lo más querido, el sustento de todas las familias, la ventana por donde se contemplaba la vida. Nada faltaba. Los pocos vecinos de Santa Lugarda tenían sus tiendas de víveres, de ropa, de zapatos. Hasta un médico tenían por si alguien se caía de un caballo o un obrero del central sufría un accidente. Mi madre llamaba a Santa Lugarda "paraíso de azúcar y miel", y casi hasta los últimos años de su vida, cuando hablaba de Santa Lugarda, sus ojos recobraban su brillo, mezcla de nostalgia y alegría. Una noche desperté sobresaltada al escuchar unos gritos a través de un tabique de madera, muy cerca de donde yo dormía. Se trataba de una de mis primas que iba a parir. Escuché cuando alguien subía a un caballo y una voz: "Pronto llegará el médico". Nadie dormía. Yo, mucho menos. Estaba tan asustada que no me acordaba ni de rezar. Al poco rato llegó otro caballo. Sentí los pasos apresurados de varias personas dentro de la casa. Mi prima seguía quejándose y yo me moría del miedo. Mi tío Paulino se secaba el sudor. Sonreía. De pronto, el llanto de un niño llenó la casa. Minutos después el médico salía a la puerta para anunciar que se trataba de un varón. Fue entonces que lo conocí. Se sentó a mi lado y regalándome un caramelo se puso a conversar conmigo. Tal vez vio el miedo reflejado en mis ojos. Era un hombre joven, delgado, vestido de blanco, cuyo rostro se quedó para siempre en mi memoria. A los pocos días subimos al tren, de regreso a la capital. Atrás no sólo quedaban las extensas plantaciones de caña perdidas en el horizonte. También la imagen del primer médico de campo que vi, tan parecido a un ángel salvador, diciéndonos adiós desde el andén. En Santa Lugarda todo ha cambiado. Al caserío le dicen Lugardita. El central dejó de moler. Algunos familiares han abandonado el país. De aquel "paraíso de azúcar y miel" no queda nada. Ni siquiera el nombre. El Dr. Elcire Guillot, quien es miembro del Centro de Salud y Derechos Humano, “Juan Bruno Sayas”. Señala en un mensaje electrónico que hemos recibido, que su familia volvió a ser atacada por esta institución represiva de la dictadura castro comunista. El pasado miércoles 15 de marzo, a menos de una semana del funeral del abuelo materno y cuando aún la familia del Doctor Guillot se encontraba consternada por el deceso de su entrañable familiar; su domicilio, en el habanero Municipio de Boyeros, se vio invadido en su privacidad en momentos de dolor para la familia; por tres miembros de la Seguridad del Estado. Se reconoció entre ellos al teniente Eliécer por sus visitas anteriores. Preguntaron por Elcire (Dr. Guillot) y al informarles a los agentes que hacia aproximadamente una semana no esta en casa, tras la visita de su hermano que vive en Alemania en ocasión de la muerte del abuelo; parece que estos lo interpretaron como una posible gestión de salida ilegal del país. Días después agentes de la Seguridad del Estado y miembros de la policía política se personaron en casa de la familia del Doctor Guillot y al decirles que “estaba para la Habana”, trataron a su familia, que hasta ese momento era inocente de su actividad en la disidencia, empleando un tono amenazante y advirtiendo de que: de no presentarse en la unidad de la PNR serian multados. Por estas razones la familia del Doctor Guillot esta atemorizada por la que le pudiera pasar, al Dr. Guillot ante las amenazas recibidas que de: “no dejar su trabajo contrarrevolucionario lo iban a desaparecer”. ¿Cómo es posible que en el país que más se respetan los Derechos Humanos, según dice el gobierno cubano, ocurran cosas como estas? Los agentes no mostraron el más mínimo respeto a esta familia que pasaba por un momento de dolor atacando con su habitual lenguaje amenazante, e invadir el domicilio de su familia. 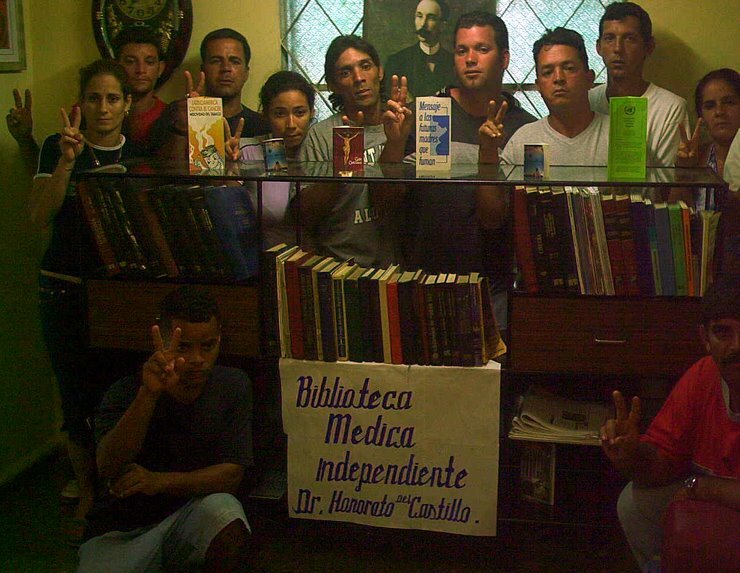 Proyecto de Bibliotecas Médicas Independientes de Cuba. (BIMEIC). Al pueblo de Cuba, a nuestros colegas que sufren desde la oscuridad por las injusticias de un Dictador y a todo el que ama la libertad y la desea para los demás. Las Bibliotecas Independientes (BI) son un espacio para la lectura, el debate y el análisis de diversos materiales con la intención de ampliar el horizonte cultural de todas las personas y con el propósito de ofrecer información libre y enriquecer el crecimiento del ciudadano con capacidad para enfrentar los desafíos de la democracia en Cuba. ¿Qué son las Bibliotecas Médicas Independientes (BMI) y cómo surgen? Son una alternativa cultural y científico-médico para el personal de la salud en Cuba y de beneficio para el pueblo, surgen espontáneamente producto de las diferentes opiniones, puntos de vistas y criterios alternativos de un grupo de galenos cubanos comprometidos con la suerte y el destino de nuestra Patria, que asumimos el deber de contribuir a mejorar la Salud de nuestra sociedad y buscar soluciones a los graves problemas existentes en el ya decadente Sistema de Salud. • Sensibilizar al sector de la Salud en el conocimiento y defensa de los derechos más fundamentales del ser humano, como son los Derechos Humanos. • Fomentar en la sociedad civil un estado de derecho hacia la Democracia. 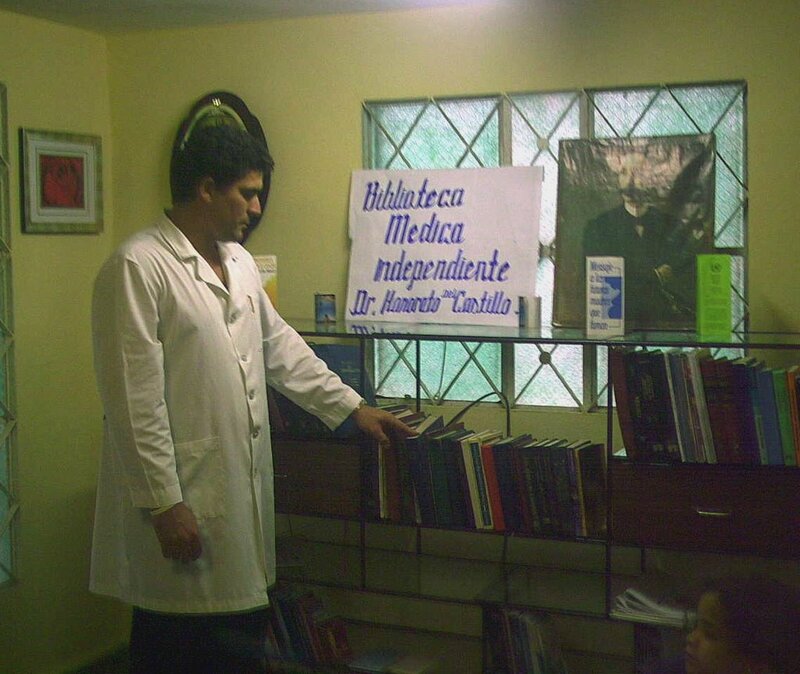 Crear bibliotecas médicas independientes a lo largo y ancho del territorio nacional. Establecer una red de información médica nacional, paralela e independiente del Sistema Nacional de Salud. • Contribuir a la superación, preparación y desarrollo científico de los estudiantes y profesionales de salud. • Orientar y promover la investigación científico-médico. • Crear las bases necesarias en el Sistema de Salud para la futura transición lejos de toda traba ideológica y al servicio del pueblo y para el bien del pueblo. • Servir de enlace entre profesionales e instituciones de la salud y sectores interesados en ayudar y contribuir con el buen desarrollo del proyecto. • Colaborar y apoyar otros proyectos destinados a perfeccionar el sistema y el estado de salud del pueblo cubano. Las BMI serán creadas por las colecciones personales de los galenos y técnicos de la salud y enriquecidas con donaciones de libros, revistas, folletos, CD y otros materiales al respecto; los que serán enviados por todos los hermanos y colegas que desde Cuba y otros países deseen colaborar con el Proyecto. Aspectos negativos en el Sistema Nacional de Salud que contribuyeron en la creación del Proyecto. • Deterioro de las instalaciones de salud y el estado de salud de la población. • Limitado y controlado acceso a las fuentes de información, revistas médicas, Internet, organizaciones científicas y médicas internacionales y congresos médicos. • Favoritismo y exclusionismo político en los centros de trabajo. El proyecto no pretende desafiar al régimen pues pondría en peligro uno de los más serios proyectos desarrollados por los galenos cubanos dentro de la Isla, sino que tan sólo pretendemos fortalecer establecer las bases necesarias para un Sistema de Salud digno y justo para los ciudadanos cubanos. El proyecto BIMEIC precisa de ayuda material y apoyo de todos los cubanos de bien partidarios de la libertad de su Patria. El respeto a la libertad y al pensamiento ajeno, aun del ente más infeliz, es mi fanatismo: si muero o me matan, será por eso. Estimados amigos ya el proyecto es un hecho, ahora para que se haga realidad cuento con la ayuda ofrecida por ustedes, donde y a quién me puedo dirigir, quienes o quién van a patrocinar el proyecto BIMEIC. Se extiende epidemia de Hepatitis en Cuba, mientras…, este país dona 30 hospitales equipados a Paquistán. Se extiende epidemia de Hepatitis en Camagüey, Cuba. La hepatitis viral continúa afectando a un número mayor de personas en la provincia de Camagüey, sin que las autoridades competentes hayan podido ponerle freno a la propagación de esta enfermedad infecto contagiosa. Pacientes de todas las edades son diagnosticados diariamente en los centros asistenciales de salud pública de los municipios agramontinos, contagiados del padecimiento hepático. Sin embargo, todo parece indicar que no existe un método apropiado para impedir la propagación del mismo, pues desde hace varios meses la población está enfrentándolo, en medio de la escasez de reactivos para realizar los análisis complementarios, esenciales para el diagnóstico y tratamiento. Algunas personas opinan que las vías fundamentales de infección son la insalubridad general que provoca la existencia de plagas y vectores; la contaminación ambiental, especialmente la falta de potabilidad del agua para el consumo humano, y la falta de higienización de las vasijas en que se sirven alimentos, sobre todo líquidos, en los centros públicos donde se consumen bebidas de todo tipo. Lo cierto es que la hepatitis se ha convertido en una nueva preocupación para los camagüeyanos, que temen infectarse principalmente por lo difícil que resulta curarse sin eliminar las causas que provocan la enfermedad; e impedidos de llevar a cabo el tratamiento indicado, que incluye una rigurosa dieta casi imposible de hacer en medio de tantas penurias. 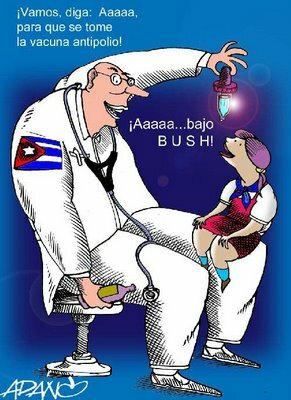 Donará Cuba a Paquistán Hospitales de campaña. Un memorando de entendimiento entre Cuba y el Islamic International Medical College Trust en Paquistán fue firmado la víspera en Islamabad, en el cual se establece que en aquellos lugares donde la Brigada Médica Cubana ha prestado sus servicios de manera gratuita estos se mantendrán una vez concluida la misión. El documento fue rubricado por Iván Mora, encargado de negocios en esta nación centroasiática, y Hassan Khan, vicedirector de la institución paquistaní, con la cual Cuba trabajó aquí desde un inicio. En el encuentro también se conoció que está previsto firmar documentos similares con otras organizaciones y el más importante de todos será con el gobierno paquistaní, al que le serán donados alrededor de 30 hospitales. Por su parte, Hassan Khan agradeció la ayuda del gobierno cubano y elogió la labor de los profesionales de la salud, quienes han venido de muy lejos para ayudar a su pueblo sin tener en cuenta las adversidades del clima y la altura de los lugares. Por la parte cubana estuvieron presentes además Ilia Acevedo y Antonio Vargas, directores de los hospitales ubicados en Attar Shisha y Hattián 2, en la provincia de North West Frontier, al norte de Paquistán, así como los doctores Alcides Ricardo y Luís Oliveros, quienes recibieron una placa alegórica del Islamic International Medical College Trust. Foto izquierda: Paciente cubano hospitalizado. Foto centro, Niño cubano en un barrio marginal de la capital cubana. Foto derecha. Funcionarios cubanos firmando los memorandos de entendimiento. Esta caricatura es publicada en el sitio pro-castrista Cubadebate “contra el terrorismo mediático". Independientemente de la valoración favorable o condenatoria que se tenga sobre el actual inquilino de la Casa Blanca, lo que queda de manifiesto es que las campañas nacionales e internacionales de la Salud que llevan a cabo en Castrolandia (Cuba comunista), son instrumentadas con fines políticos. Una imagen que por demás es tremendamente ofensiva y fuera de lugar, ahí es donde uno se percata de la falta de talento y elemental sentido común que tienen los manipuladores Castro comunistas. En el mundo actual jamás ningún país y ningún medio publicaría esa imagen tan ofensiva: un viejo supuestamente Médico que más bien parece un fantasma, y con una cara de degenerado tremenda, que más bien parece que lo que esta aplicándole es un veneno por la mirada que pone y la pose ingenua de la niña; con un pomo en la mano caída que más que medicina parece una botella de bebida alcohólica, y para colmo con la niña sentada en las piernas. ¿Esto forma parte de la “Batalla de Ideas” en Cuba?. He leído un interesante articulo titulado: “Los cubanos también votaron en el RR” (Referendo Revocatorio) de la periodista venezolana, Thamara Nieves, publicado hace algunos meses,- por enero del presente año para ser exacto -, en la Revista: Descifrado en la Calle. Digo interesante, y lo es. Parte la talentosa articulista, de una rigurosa y hábil investigación que consistía en dar seguimiento a conversaciones telefónicas, frases y expresiones de cubanos en Venezuela para llegar a conclusiones, que si bien no nos sorprenden; si resultan en el contexto venezolano, aleccionadoras. En el análisis de los presupuestos y resultados de este artículo de investigación, conviene señalar tres consideraciones básicas: una aclaración necesaria sobre imprecisiones de la autora en el artículo de referencia, el control de las llamadas telefónicas como búsqueda de un estado de opinión y la participación política de los cubanos é influencias de estos en sectores o áreas que la autora considera neurálgicos de la sociedad venezolana. Citando mi articulo: “Médicos cubanos en Venezuela: Galenos o comisarios políticos”; publicado en el periódico digital independiente, Diario NotiCuba Internacional; la periodista venezolana señala lo siguiente: “El testimonio de un médico cubano, tilda de xenófobo a los venezolanos por rechazar esta misión”. Esto,- como se puede apreciar en mi artículo -, es inexacto e injurioso; es otro autor al que cité cuando digo: “otro articulista califica a los ataques a estos médicos como el depravado ataque mediático, xenófobo y racista”. Léase cuidadosamente el artículo, en el cual se citan opiniones muy diversas, pero nunca se califica a los venezolanos de xenófobos. En otro orden de cosas y considerando la extensa cita a mi artículo, ésta incluye una frase que de hecho la atribuye al texto cuando no es así; la frase en cuestión dice: “este apoyo se extendió a los rebeldes del Salvador”. En ningún momento tratamos de relacionar la presencia de los cubanos en Nicaragua con la ayuda que éstos prestaban a los guerrilleros salvadoreños del FMLN, no tenia ni tengo suficientes elementos para considerar ésto en mi artículo; no era mi objetivo cuando lo escribí. Hechas estas aclaraciones necesarias , pasemos al artículo . El control y la vigilancia de los cooperantes o internacionalistas cubanos donde quiera que estén, son intensa y considera todos los aspectos de las relaciones, y los medios para comunicar opiniones e ideas. Estamos de acuerdo que, “estos tienen un régimen bastante estricto de vigilancia en Venezuela”. Es así; en Nicaragua un agente de la contrainteligencia militar cubana me aseguró que el chequeo de la correspondencia que envían los cooperantes a la Isla es rutinario, se revisa una muestra tomada al azar que representa el 5 % de toda la correspondencia. “No te imaginas las cosas que se leen” me dijo con tono picaresco, para agregar, “pero nos interesa sólo los asuntos de política”. Allí conocí de un médico internacionalista en Nicaragua que fue despachado a La Habana por escribir a su familia opiniones comprometedoras. “Aquí todo está tranquilo”, es la expresión más frecuente de los cooperantes cubanos a sus interlocutores en la Isla en sus frecuentes llamadas telefónicas; frases y exclamaciones de apoyo a Chávez también abundan, y una rara expresión que en boca de un cubano pasa por el relajo: “cinco años más de libertad”; todo esto, porque Chávez había ganado el referendo revocatorio. Después de 40 años de Dictadura, los cubanos aprenden a expresarse con una fina ironía y un cinismo rampante que muchas veces expresa lo contrario de lo que quieren decir. La articulista, Thamara Nieves, se asombra de la frecuencia con que los cubanos que trabajan en Venezuela hacen llamadas a la Isla, considerando el alto costo de estas llamadas. Dudo que los internacionalistas cubanos paguen esas llamadas( a razón de 0.50 dólares por minuto) ; investiguen esto , porque estoy seguro que esa factura la paga el gobierno de Chávez. En la empobrecida Nicaragua de los sandinistas, nunca los internacionalistas cubanos pagaron por una llamada a Cuba. Partimos de las premisas de que estas llamadas telefónicas: no se pagan, son monitoreadas por los sistemas de escuchas de la Dirección General de Inteligencia cubana, y representan una forma de obtener un estado de opinión que permite hacer evaluaciones precisas de los cooperantes internacionalistas y de la población en general. Recomiendo leer mi artículo: “Armas de penetración masiva"; para tener una idea de lo que digo. Por último, el control de las comunicaciones en Venezuela está ya en manos de la Inteligencia cubana, sino controlada, por lo menos penetrada. En la Nicaragua sandinista, los técnicos cubanos operaban dentro de la Empresa de Telecomunicaciones; además que contaban con un sistema de comunicaciones mediante microondas con enlace al sistema del litoral en Cuba. Hacían uso de un código de salida para llamadas al exterior ( se supone a Cuba) para aquellas personas de confianza que aparecían en un listado. Era el Código 35. El 2do. 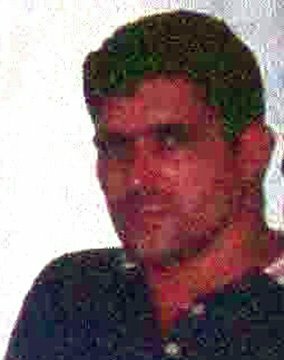 Jefe de la Misión Médica Cubana en Nicaragua (1988) utilizó este código para hacer una llamada a los Estados Unidos; pocos días después fue detenido y enviado a La Habana. “Tenia dolor de muelas y lo mandamos a atenderse a Cuba”, dijo con sorna, el agente principal que controlaba y vigilaba a los médicos cubanos en Nicaragua. Los deseos e ilusiones que el artículo señala al considerar estas llamadas telefónicas a la Isla, son los intercambios propios de personas que,- como los cubanos -, han vivido en una sociedad de privaciones y temores. Si los regalos que los cubanos prefieren son los electrodomésticos, juguetes, muebles y calzados y éstos, pueden que lleguen a deslumbrar a médicos, maestros y deportistas; no hay porqué extrañarse. Tal vez ahora los venezolanos se enteren que hay niños cubanos nacidos en las últimas dos décadas que no conocen un juguete. En Nicaragua, durante el período sandinista, era sumamente grave aceptar un regalo y cuando era recibido tenia que ser considerado por la dirección de la Brigada y el Secretario del Partido (PCC), antes de permitir que el cooperante hiciera uso del mismo; sobre todo si era un electrodoméstico. Por las informaciones que tengo, esto no sucede en Venezuela, y los cubanos pueden aceptar y enviar o llevar cuánto articulo que tengan a bien haber recibido .Veo que hay un amplio traslado de especias de todo tipo de Venezuela a Cuba. La pacotilla ha aumentado tanto en cantidad como en calidad. No obstante el artículo investiga ,- a punto de partida de opiniones tomadas de llamadas telefónicas a Cuba -, la distribución de los cooperantes o internacionalistas cubanos en el territorio de Venezuela; relacionándolo con el grado de pobreza, analfabetismo y privaciones sociales en algunas regiones donde están ubicados. Las palabras de estos cubanos muestran sus anhelos, temores y quejas. También demuestran hasta que punto están manipulados, vigilados e incluso vituperados; en la medida en que viven en una sociedad donde una buena parte de sus integrantes, no los aceptan. La periodista, Thamara Nieves, a modo de conclusión de su reportaje de investigación, señala: “El resultado permite concluir que tienen (los cubanos) cédula, que están vigilados, que son movilizados para las manifestaciones y que votaron. El otro resultado es la ubicación estratégica de los contingentes cubanos en empresas del Estado y cerca de todos los aeropuertos y aduanas”. El grado en que se han involucrado los cooperantes cubanos en Venezuela es sorprendente; siempre lo he dicho. El Sátrapa cubano está jugando con todas las fichas en el caso de Venezuela. No espera perder. Hasta ahora el juego se inclina a su favor. Observo que en mi experiencia en Nicaragua en los años 80’s, no existía cédula alguna de identificación para los cubanos que participaban en múltiples proyectos allí. Estaba terminantemente prohibido participar en actos políticos, manifestaciones ó concentraciones públicas; por supuesto con los Sandinistas. Sin embargo, alrededor de septiembre de 1988 cuando ya estaban firmados y habían entrado en vigor los Acuerdos de Esquipulas, se convocó a una gran concentración por el Frente Sandinista y de apoyo al FSLN aún en el poder. A esta concentración fueron convocados y conducidos los cubanos radicados en Managua. Cuando pregunté al Jefe de Brigada en Nejapa cuál había sido la razón para este repentino cambio de actitud, se limitó a decirme: orientaciones de la Embajada, (cubana por supuesto). Ahora en Venezuela los cooperantes cubanos de mutuo acuerdo entre ambos gobiernos, no sólo tienen cédulas que los identifican, sino que se les permite votar, y votar claro está por los candidatos oficialistas. Pero lo alarmante de todo esto es que solicitan todos los datos de identidad de familiares en Cuba para hacerles sus cédulas de identidad como residentes en Venezuela. ! Esto es relajo y sin orden! ¿Con qué finalidad se hace esto? Es probable que ya estén pensando en futuros trámites migratorios. La autora del artículo toma nota de la ubicación de los cooperantes en relación a las áreas de empobrecimiento de Venezuela. Tal vez esto no sea lo más importante; pero al señalar la cercanía a los servicios aeroportuarios y de aduana se aproxima a una clara apreciación del peligro que esto representa. No debe preocuparle que médicos, maestros ó entrenadores deportivos residan cerca de estas facilidades. Más bien debe preguntarse donde están los soldados y agentes debidamente entrenados de Tropas Especiales del MININT cubano. ¡Por que de que están, están! En los servicios de aeropuertos, aduanas, puertos etc. como en múltiples áreas claves de la seguridad, las comunicaciones, etc. ya están instalados como técnicos y asesores. Especialistas cubanos debidamente seleccionados, entrenados y ubicados convenientemente por los servicios de inteligencia con el conocimiento y aprobación de la contraparte venezolana. No hay la más mínima reserva en esto de colocar técnicos y asesores cubanos en puestos claves; la autora del artículo reconoce que están, incluso, en oficinas de las Alcaldías, facilitándole los trámites a un diputado de la oposición para obtener una cédula de identidad. Todo parece indicar que en Venezuela la cosa esta de “apaga y vamos’. A los cubanos no les interesa controlar áreas neurálgicas ,sino estar presente; estamos de acuerdo. El asunto es estar en el sitio adecuado donde los intereses de inteligencia así lo determinan. En Nicaragua trabajaban un pequeño grupo (3 o 4) de asesores cubanos en cada Ministerio o Institución importante del Estado; eran funcionarios cubanos casi siempre de cierto rango y que eran escuchados y sus opiniones eran tenidas muy en cuenta. Otro tanto ocurría en sectores tan sensibles como los servicios de Seguridad, Defensa y las Comunicaciones, entre otras. En el artículo se hace referencia a las secuelas que deja en la conciencia nacional cubana las misiones internacionalistas; afirmé en un artículo anterior, aparecido aquí en estas páginas que: “de éstas masivas experiencias sólo queda en lo personal, detritus de historias inacabadas, excrecencias de la memoria confundidas por los razonamientos mezquinos”. Debo de reconocer que no siempre es así, al menos en el plano personal. Algunos cubanos al ir a cumplir una misión internacionalista, logran salir del asfixiante ambiente en que viven en Cuba, además adquieren bienes no perecederos que después usan y disfrutan en un país de pobreza y limitaciones materiales. Logran mejorar su record revolucionario, al obtener la tan preciada Medalla de Trabajador o de Combatiente Internacionalista; que les permite progresar y ascender en su vida profesional. No creo que todo esto signifique un trauma nacional, pero aún está por escribirse este capítulo de la historia reciente de nuestro país. Por lo pronto, el aspecto sustancial de la presencia cubana en Venezuela es apenas tratado de forma circunstancial por la periodista; cuando en realidad el asunto adquiere proporciones alarmantes. Todo parece indicar que el Sátrapa, Fidel Castro, ha considerado a Venezuela como su última aventura y se ha lanzado a fondo de forma calculada. Ha realizado un trabajo paciente y riguroso de intromisión aceptada y se ha valido de la experiencia acumulada a lo largo de muchos años; en regiones remotas con historias y culturas muy diferentes. Los asesores cubanos están en Venezuela en número tal, que supone en su momento una ruptura de la soberanía de ese país. Su número y desempeño en la vida nacional de ese país y el momento tan singular al presente, hacen que cualquier sacudida del orden actual llevaría a una situación en extremo convulsa, explosiva y muy peligrosa. Hay dictadores “jugando al duro”, pero sobre todo hay muchos cómplices en el juego y como bien señala la periodista venezolana, B.Mota: “al final, todos, sin excepción sufriremos las consecuencias de esta complicidad silente que estamos viviendo”. Aunque en realidad la complicidad no siempre es silente ó no es tan silente. Así que, ya veremos. Foto de la Periodista Thamara Nieves y de su articulo. Inaugurada en Cuba una Biblioteca Médica Independiente (BMEIC). 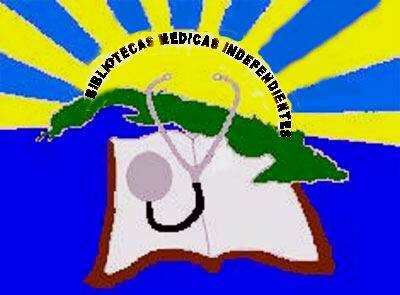 La primera Biblioteca Médica Independiente (BMEIC), fue inaugurada en la Habana, Cuba el pasado 24 de febrero del 2006, con el nombre del insigne patriota: Dr. Honorato del Castillo y en ocasión del 111 Aniversario del Grito de Baire. Recordando que por esta fecha nuestro Apóstol, José Marti, hizo un llamado a la unidad de todos los cubanos que deseaban la libertad de su Patria. En esta fecha se dio continuidad a las luchas por la independencia de Cuba en lo que se llamó, la guerra necesaria. Esta Biblioteca Médica, se encuentra ubicada en la casa vivienda del conocido opositor y secretario del Partido Popular Republicano (PPR), Dr. Orestes Campos Venegas, y su dirección es: Real 43, Finca “El Limón” .Bacuranao. Guanabacoa, CH. Cuba. La Biblioteca Médica Independiente “Dr. Honorato del Castillo” abre sus puertas para los estudiantes y profesionales de la Salud, y a la población en general como una forma de ampliar su horizonte científico – técnico y cultural. De esta forma se dio inicio a uno de los más serios proyectos de los médicos cubanos, quienes desarrollan este difícil empeño, desde el interior de la Isla. Nosotros abogamos por cambios pacíficos y democráticos conducentes a la defensa de los Derechos Humanos; y a la búsqueda de soluciones para mejorar la ya difícil situación del Sistema de Salud en Cuba. En el acto de inauguración participaron activistas del PPR y vecinos de lugar que se mostraron interesados en apoyar y colaborar en el desarrollo de tan importante centro científico-cultural. Hacemos un llamado a todos los profesionales de la Salud para que apoyen y extiendan este proyecto de Bibliotecas Médicas Independientes a otros lugares de la Isla, así como a los amigos del resto del mundo para que nos apoyen y colaboren en hacer realidad este proyecto. * Medico, Cirujano General. Secretario del PPR. Miembro del Centro de Salud y DDHH. Las fotos corresponden al acto de inauguración de la BMEIC.